For a few seconds on 10 November 2015, evening news programs showed a document with drawings and details of a planned Russian nuclear-capable underwater drone that would be launched from a submarine, dubbed Status-6. Such a torpedo was envisaged in 1950s, during Cold War, by nuclear physicist Andrei Sakharov - later a famous dissident and peace activist. The 100-megaton warhead could devastate US coast with massive tsunami and intense radiation. In bland but chilling language, the document said the purpose of the pilotless subs -- still on the drawing board and at least a decade away from any possible production -- would be to 'strike important enemy economic facilities in coastal areas.' 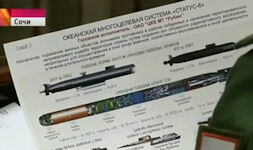 The Russian government newspaper Rossiiskaya Gazeta later reported details of the weapon, without showing the diagram, and speculated about a super-radioactive cobalt device. NTV television and Channel One state television, which are under strict Kremlin control, both featured footage from a meeting that President Vladimir Putin held with top defense officials in the southern Russian city of Sochi. President Vladimir Putin's spokesman, Dmitry Peskov, said that NTV and state-run First Channel and NTV had erred by slipping 'secret data' into their broadcasts, and that the authorities would take steps to ensure it doesn't happen again. But some observers suspect it was not by accident. In the wake of the incident, state media have prominently featured an interview with a defense expert giving more details about the "secret" weapon, fueling speculation that the original leak was no accident. Radio Sputnik, which is part of the Russian state news agency Sputnik, featured an interview with Igor Korotchenko, chief editor of the magazine Natsionalnaya Oborona (National Defense), who provided further details about the Status-6 weapons system. According to the document, the drone would be launched from two new models of submarines that Russia has started producing over the past three years. It said the drone would reportedly have a maximum range of 5,400 nautical miles (10,000 kilometers) while traveling at a depth of 1,000 meters. It was developed by Rubin, a submarine design bureau in St Petersburg. 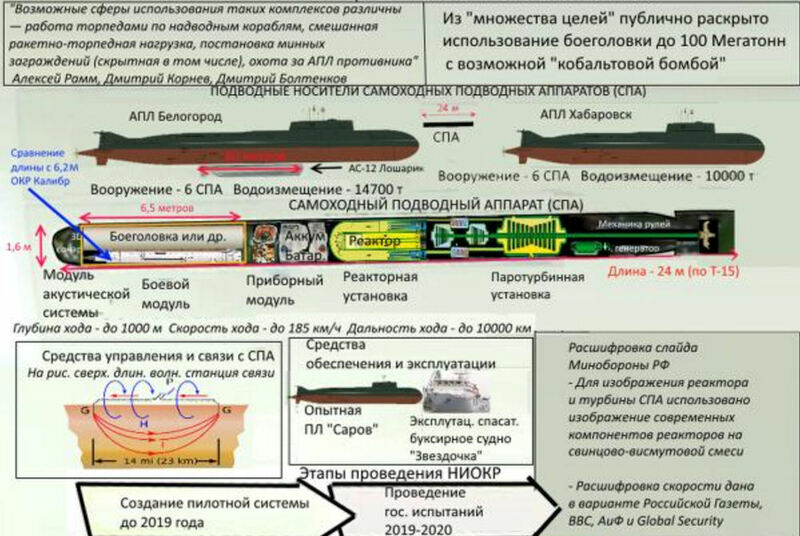 It would, apparently, be launched by nuclear-powered submarines of the 09852 "Belgorod" and 09851 "Khabarovsk" series. Rossiiskaya Gazeta called the torpedo a "robotic mini-submarine", travelling at 100 knots (185km/h; 115mph), which would "avoid all acoustic tracking devices and other traps" [the combitioan of speed and range claimed for this system is implausible]. Creation of Russian multi-purpose ocean system "status-6" devalue the missile defense system (NMD), the United States and will maintain the strategic parity in the world, according to the chief editor of "National Defense" Igor Korotchenko. "Given the commitment of the USA to establish a missile defense system to intercept Russian intercontinental ballistic missiles, it is clear that our military leadership is thinking how to solve the problem destruction of the enemy in the event of a real war, including using non-conventional means of delivering a nuclear warhead to the enemy's territory", - Korotchenko told Tass. According to him, it is to some extent the work of the future, to have in the arsenal of weapons, which devalue the US missile defense system. 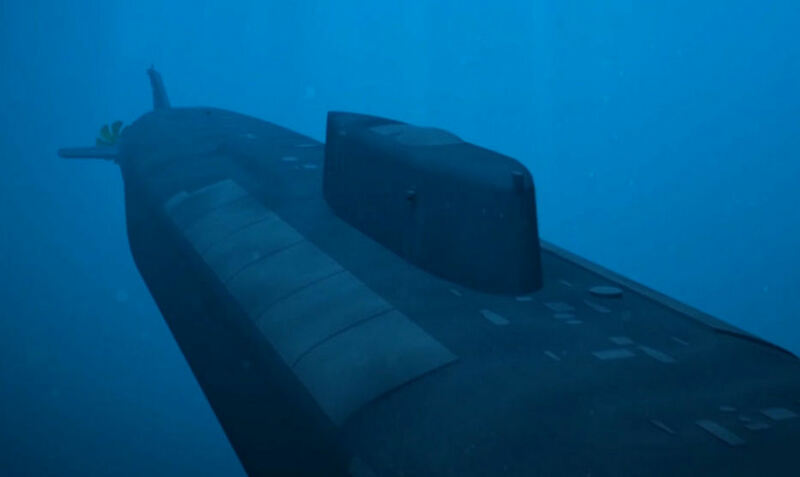 "Status-6 is a conglomeration of the latest Russian submarine technology," Korotchenko said in the interview, which was extensively quoted by RIA Novosti and Tass state news agencies. "The purpose of this ocean system is transporting a high-powered nuclear warhead to the coast of the enemy." The expert believed that the creation of such a torpedo will support strategic parity in the world and reduce the likelihood of a nuclear war. Speaking about the possibility of the real existence of such a development, the expert said that "the meetings of the President commanders go with real instruments, not with pictures." "Therefore, we can say that this is a real development, which is likely, in the final stages of creation" - added Korochenko. It is said that the Status-6, codenamed Kanyon, was tested on November 27, 2015 during a secret operation. 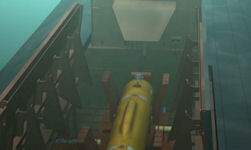 The test should have been performed by a Sarov class submarine, project 20120. The Status-6 should have a diameter of 1.6 meters, a length of 24 and would be able to reach an operating depth of one thousand meters. New details on the reactor emerge. This would be a small eight megawatt liquid metal-cooled nuclear reactor, which would allow the Status-6 to reach a cruising speed of 55 km / h. However, the second data on speed is interesting. According to the Russian sites, the Status-6 could accelerate up to a speed of 185 km / h. If these data were correct, the Russian torpedo would certainly be able to bypass any existing NATO defense system. The Mark-48 torpedo, the main offensive system of the US Navy, has a maximum range of 55 km and an operating depth of 800 meters. This means that if the Status-6 operates close to its maximum depth (one thousand meters) at a speed of 185 km / h, the US Navy's primary weapon could not reach it and destroy it. 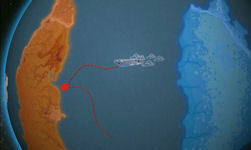 At present there should be three submarine platforms designed for the Status-6. 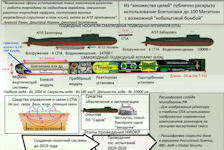 The K-139 Belgorod Project 09852, evolution of the Oscar II Class 949A Project, will be able to transport four of them. The B-90 Sarov class should be able to carry two. Of the submarine Khabarovsk, project 09851, similar to the Borei class, almost nothing is known. The new Nuclear Posture Review (NPR), which established the US nuclear strategy for the coming years, confirmed the existence of the unique Russian Nuclear Torpedo Status-6. The NPR report showed for the first time that the US side recognizes the Status-6 nuclear torpedo as a real weapon system, respectively. as a new Russian capability to carry out nuclear strikes. "In addition to the modernization of older Soviet nuclear systems, Russia is developing and deploying new nuclear warheads and launchers," said a declassified report from the NPR report. "This endeavor involves a number of improvements for each part of the Russian nuclear triad of strategic bombers, naval and land missiles, and Russia has developed at least two new intercontinental systems, a hypersonic return body (with a nuclear warhead and a new intercontinental submarine autonomous torpedo with a nuclear warhead , " stands in the extract of the report. The Torpedo Status-6, which the US party assigned the Kanyon designation, should be tested at least once according to the NPR. This test was captured by the US Intelligence Service on November 27, 2016 after the Status-6 torpedo was launched from the Sarov diesel-powered offensive submarine. According to Washington Free Beacon, submarines of this class are used to test and certify new technologies. The Washington Free Beacon states that Status-6 has a reach of 6,200 nautical miles (10,000 km), sinking to a depth of 3280 m and capable of sailing up to 56 knots (103) km / h. A torpedo of about 1.6 meters in diameter (three times the size of conventional torpedoes), according to Russian reports, is supposed to deliver a nuclear charge of up to 100 Mt. The development of torpedoes is ensured by the Petrograd design office, Rubin, the main Russian submarine design office. Status-6 can be discharged from at least two different submarine classes - the Sarov submarine (3950 t) and Oscar-class rockets (17,000 tons) capable of transporting up to four Status-6 torpedoes. In the "President's Address to the Federal Assembly" on 01 March 2018, Putin stated "It is well known that in the world unmanned armament systems are actively designed and created. I can say that in Russia unmanned underwater vehicles capable of moving at great depths (and, I would say, at very deep depths) and intercontinental range at a speed that is multiple of the speed of submarines, the most advanced torpedoes and all types, even the most high-speed, surface ships. It's just fantastic. They have low noise, high maneuverability and are practically invulnerable to the enemy. Funds that can resist them, to date in the world simply does not exist. 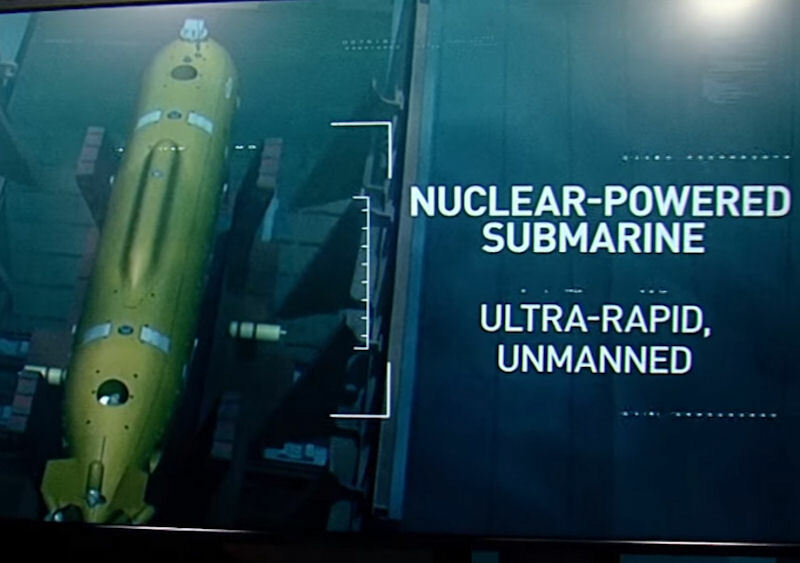 "Unmanned underwater vehicles can be equipped with both conventional and nuclear munitions. This will allow them to hit a wide range of targets, including carrier groups, coastal fortifications and infrastructure. "In December 2017, a multi-year trial cycle of an innovative nuclear power plant was completed to equip this autonomous uninhabited vehicle. The nuclear installation has a unique small size and at the same time an extremely high power-to-weight ratio. When the volume of a hundred times smaller than the setting of modern submarines, is used for greater power and 200 times less time to battle mode, that is, at the maximum power. "The results of the tests made it possible for us to proceed with the creation of a fundamentally new type of strategic weapon equipped with high-power nuclear munitions." 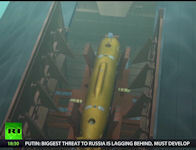 The Russian strategic unmanned underwater vehicle "Poseidon", the creation of which was announced in March by Russian President Vladimir Putin, will receive a maximum underwater speed of more than 200 km / h. This was reported to TASS on 04 January 2019 by a source in the military-industrial complex. 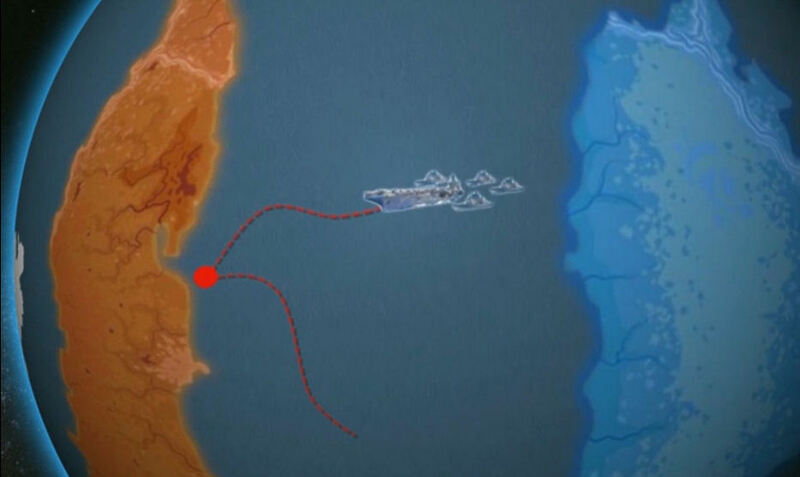 “The drone that left the submarine will go to the target at a depth of more than 1 km at a speed of 200 km / h and more (about 110 knots),” the agency’s source said. He clarified that, as in the case of the Squall rocket-torpedo, the Poseidon drone will move at maximum speed in the air cavity (a cavity with water vapor will form around the device - TASS comment). ". As the source added, “on the way to the goal, Poseidon will continuously maneuver along the course and depth, which, taking into account the speed and maximum depth of the course of more than 1 km, makes the defeat of the drone existing with a potential enemy today impossible”. The maximum underwater speed of modern nuclear submarines is about 60 km / h (30-35 knots), torpedoes - around 90 km / h (up to 50 knots). Domestic torpedo missile "Squall", equipped with a jet engine, can, according to various sources, go under water at a speed of 370 km / h (up to 200 knots), but at a distance of just over 10 km and at shallow depth. TASS does not have official confirmation provided by the source of information. As another source in the military-industrial complex reported to TASS at the end of December, underwater tests of the Poseidon unmanned aerial vehicle are currently under way. He clarified that one of the Navy nuclear submarines was used as the carrier of the drone. 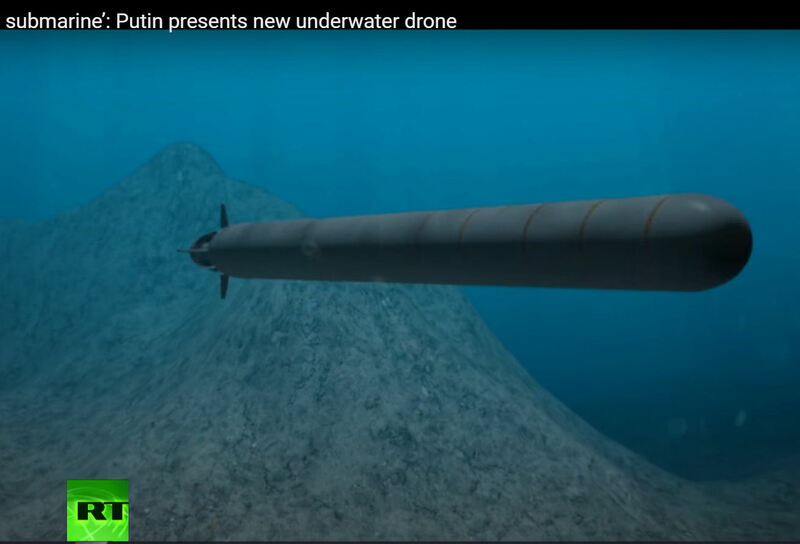 On the unmanned underwater vehicle created in Russia with a nuclear power plant for the first time told Russian President Vladimir Putin in his message to the Federal Assembly in March of this year. The president then said that these drones could be equipped with both conventional and nuclear weapons and would be able to destroy enemy infrastructure, aircraft carrier groups, and so on. The Poseidon vehicles, together with the carriers - nuclear submarines - are part of the so-called ocean multipurpose system. 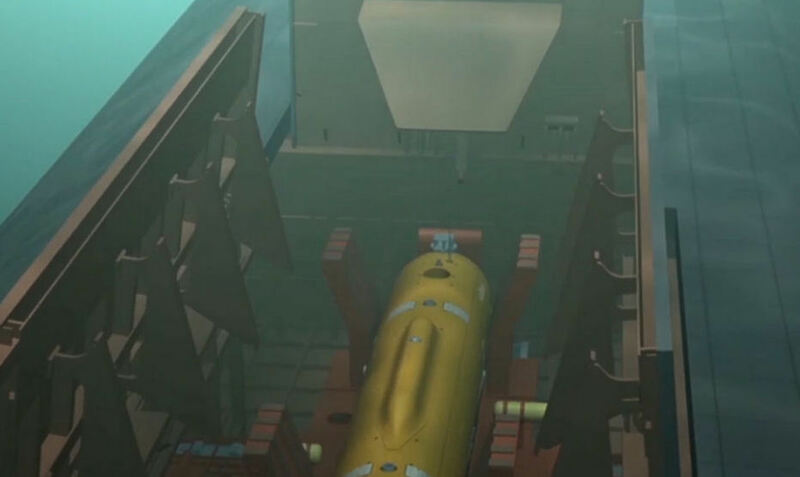 A source in the military-industrial complex told TASS that the Poseidon unmanned underwater vehicle being created in Russia would be capable of carrying a nuclear warhead of up to two megatons to destroy enemy naval bases. This contradicts earlier claims of a 100-MT yield. The Russian Navy plans to place more than 30 Poseidon strategic nuclear-capable underwater drones on combat duty, a source in the domestic defense industry told TASS on 12 January 2019. "Two Poseidon-carrying submarines are expected to enter service with the Northern Fleet and the other two will join the Pacific Fleet. Each of the submarines will carry a maximum of eight drones and, therefore, the total number of Poseidons on combat duty may reach 32 vehicles," the source said. 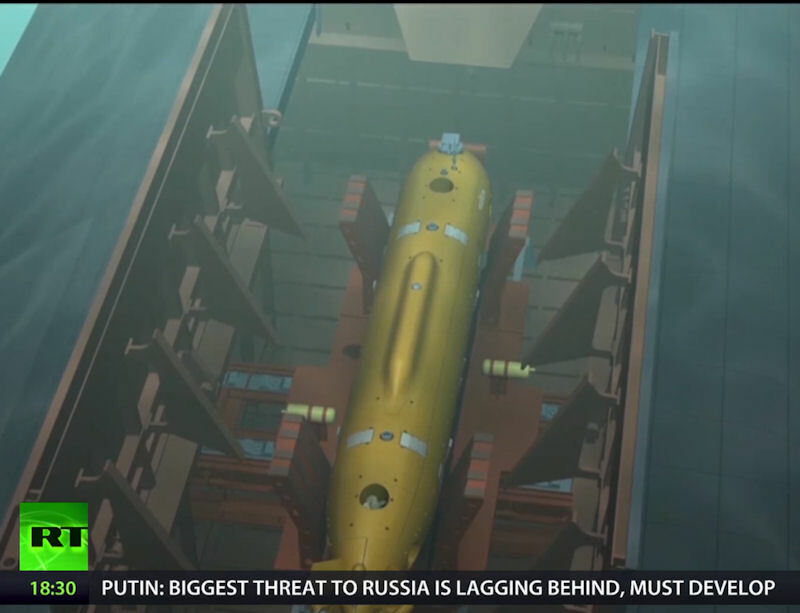 Tests of Russia's Poseidon nuclear-powered underwater drone were for the first time shown on 20 February 2019 by the Rossiya 24 TV channel. The clip, which lasts a few seconds, shows the Poseidon moving out of a container simulating the corresponding compartment of the drone carrier submarine. Earlier in the day, Russian Defense Minister Sergei Shoigu said the Poseidon sea tests had been successfully completed. In turn, retired Russian Rear Adm. Vsevolod Khmyrov said that the Poseidon’s successful bench tests allow starting tests involving nuclear submarines as carrier for the drone. "There was a full cycle of bench tests, including tests of a unique nuclear power unit, and then comprehensive marine field tests… All this allows to start a full final stage soon, i.e. tests of the drone together with its carrier," Khmyrov told reporters. 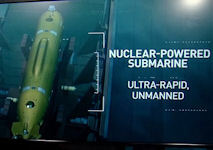 A top-notch underwater drone armed with a nuclear warhead, Poseidon, is scheduled to join Russia's arsenal no earlier than 2027, people close to US intelligence told CNBC 26 March 2019, citing their assessment. "What we are basically dealing with is a Russian submarine, that is difficult to detect, launching a drone, that is difficult to target, equipped with a nuclear warhead", one person said on condition of anonymity, adding that the Russians are determined to use the advanced nuclear-powered vehicle "as a retaliation device if their legacy nuclear weapon launch capability is neutralized during war".According to CNBC, Russia has yet to effectively test the vehicle's nuclear propulsion heart, which is key to its overwhelming power. 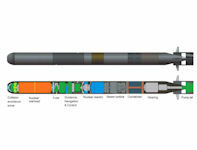 Russian Defence Minister Sergei Shoigu said in February that the Poseidon sea tests had been successfully completed. They were carried out in an offshore zone that was well protected from a potential enemy's intelligence forces. 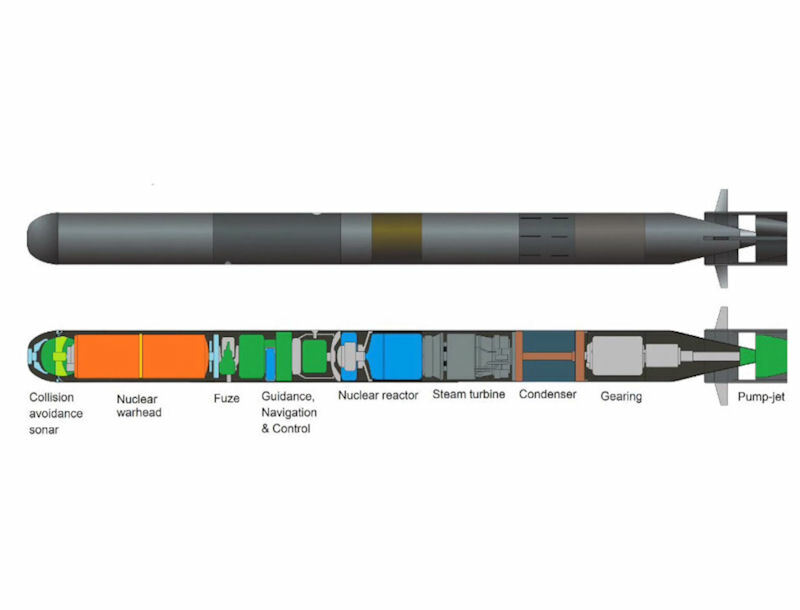 The tests of the system's nuclear warhead, finalized back in 2018 and shown on Russian television for the first time this February, proved its incredible capacity. The fact that tests have already been completed casts doubt on the credibility of CNBC's report and the cited sources. Deputy head of Russian State Duma's defence department, Yuri Shvitkin, commented on the US edition's article in an interview with RT, saying Poseidon drones will become part of the Russian arsenal much earlier than 2027. "I'll let down the US and tell them that the Poseidon system will become operational much earlier than they predict. It has mostly to do with their aggressive policies with regard to our country. American politicians openly dub Russia bellicose, and we have no time to equip the armed forces only by 2027, " the MP noted, adding that the measures are purely defensive.